Prime Minister Shinzo Abe and Philippine President Benigno Aquino III pledged Tuesday to deepen security cooperation, at a time when their countries are facing growing military assertiveness from China. During a news conference following a 45-minute meeting and a working lunch in Tokyo on Tuesday, the two leaders said the rule of law should be ensured to maintain regional stability, an apparent reference to Beijing’s muscle-flexing in territorial disputes with both Tokyo and Manila. Aquino arrived in the morning for a one-day trip, during which he also visited Hiroshima to deliver the keynote address at the 6th Consolidation for Peace for Mindanao, a conference organized and sponsored by the Japan International Cooperation Agency. “With the regional situation becoming increasingly severe, both nations are coordinating closely,” Abe said, in promising continued support for Philippine maritime security. Last year, Japan said it would supply 10 patrol vessels through official development assistance. During their 40-minute working lunch, Aquino briefed Abe on Manila’s efforts to resolve its territorial dispute with China peacefully through international law. China has been creating artificial islands on tiny outcroppings and reefs in the disputed Spratly Islands, which could be used as Chinese military outposts or airstrips, according to media reports. The Philippines asked a U.N. tribunal in March to declare China’s claim to most of the South China Sea illegal. Beijing has refused to take part in the proceedings. 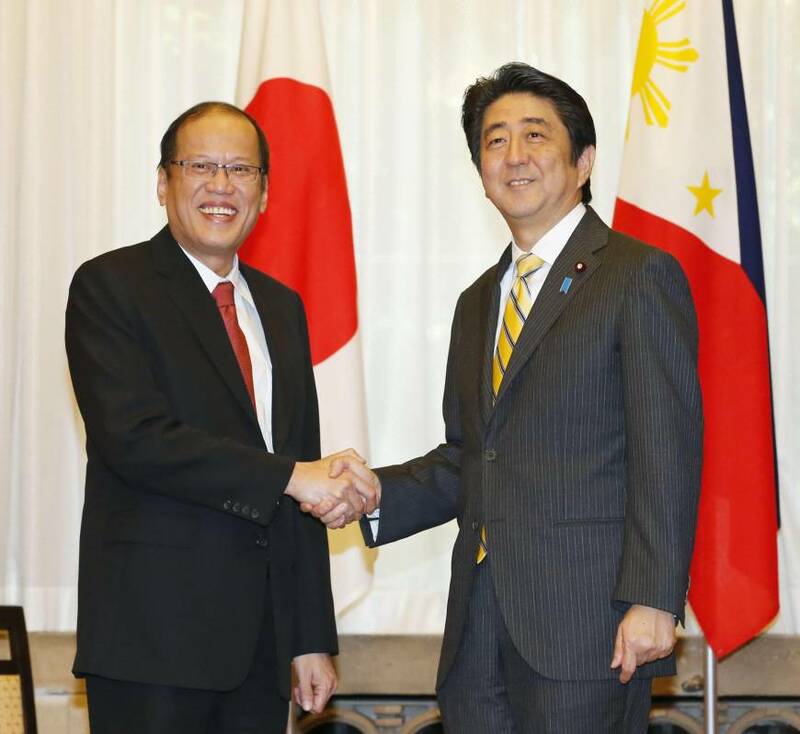 Aquino expressed support for the Abe administration’s plan to reinterpret the war-renouncing Constitution so that Japan can exercise the right to collective self-defense, which would allow the country to come to the aid of an ally under armed attack. Noting that Filipino troops engaged in peacekeeping operations in Syria have come under attack “no less than three times,” Aquino said if the Self-Defense Forces were allowed to come to the aid of such units, it would be of great benefit to nations with friendly ties with Japan. 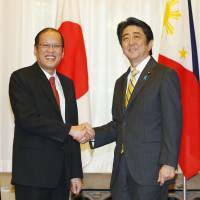 “We therefore do not view with alarm any proposal to revisit the Japanese Constitution if the Japanese people so desire, especially if this enhances Japan’s ability to address international obligations and bring us closer to the attainment of our shared goal of peace, stability and mutual prosperity,” Aquino said. This was the fourth Japan-Philippines summit in a year. This time, they were held at Manila’s request, a Japanese official said.